We had a sneak preview of this one a few weeks ago when we reviewed the lead track, “The Confession”, as a single, but this time around it’s the full four track EP with additional songs “All for the Best”, “The Fear” and “Together Alone”. 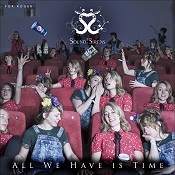 Previous Sound of the Sirens work has focussed on two voice/two guitar/stompbox arrangements that can be recreated live as a duo, but “All We Have is Time” features upright bass, violin and a little bit of piano, which add a few more colours to the palette. Lyrically, there are a few familiar themes, including breaking or broken relationships and encouragement to fulfil our personal potential, but it’s fair to say that “All We Have is Time” is a step forward into new territory. We reviewed the stomping, violin-driven “The Confession” a few weeks ago, so I’ll skip over that and start with “All for the Best”. Violin and piano dominate the intro, creating, with vocal harmonies, a very traditional, folky sound which ebbs and flows to illustrate the theme of a relationship which was once beautiful but has run its course. “The Fear” is where the introduction of violin and upright bass has the greatest impact, combining with a very catchy vocal hook to create an uptempo Eastern European feel as the lyrics delve into the attempt to create the perfect physical and spiritual union. Several key changes towards the end of the song ratchet up the tension before the resolution comes in the final phrase, ‘Go all the way’. The final song, “Together Alone” is already a live favourite and it’s easy to see why. The song demonstrates the assured use of dynamics with changes in volume and tempo, and finishes with a show-stopping a cappella ending. Add that to a lyrical message that we should all try to transcend our limitations and you’ve got yourself an anthem. When you listen to Sound of the Sirens, you hear two voices which work really well together (they do homophony and counterpoint beautifully); they have a tremendous understanding of the construction of songs and live performance, but they also write lyrics which reference the darker themes found in folk music and stories. “All We Have is Time” is a pretty good introduction to the Sound of the Sirens, but you should do two things: listen to their album “A Long Way to Fall” and make an effort to see them play live. You can do the first one any time and their next live appearance will be at Chris Evans’ Carfest this weekend. We’ll keep you posted.